New People is dead. 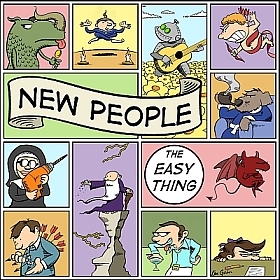 Long live New People! If you really don't want to pay anything, just keep reading this page and you will eventually get it all, because being heard is much more important to us than being paid. Listen to lots of Mark's music here. His current band is the acoustic "Mark Lint's Dry Folk" and can be followed on Facebook. Matt now runs a 3-piece called "Blue Stone" which you can also follow on Facebook. Listen to our final single "We Who Have Escaped," featuring the last incarnation of the band, including Mike Laemmrich (drums), Eric Schumann (keys) and Chris Wellner (vocals, rhythm guitar). You can hear and read about another new song of Mark's, recorded by Mark with Eric some other folks, featuring guest harmony vocals by Lucy Lawless (yes, that's Xena, Warrior Princess). Mp3s are also available on iTunes, Amazon, or CDBaby, but if you want a physical CD, order it here. You can order "Impossible Things" at CDBaby or get mp3s off of iTunes or at Amazon . You can purchase "The Easy Thing" at CDBaby, or mp3s from iTunes. or Amazon. If you want some combination of CDs other than those shown above, want CDs shipped outside the US, or have any other special requirements, please just email Mark. Our final album, "Might Get It Right"
...was over a year in the making, what with Matt becoming a dad, Mark's wife going back to school, and Nate finishing up his Ph.D. and searching for an engineering job. It was, again, recorded by us, and mixed/mastered by Jake Johnson at Paradyme Studios in Madison. It's super slick, generally very concise, with nicer-than-ever harmonies, memorable hooks, and earthy, sometimes caustic lyrics. Our Second CD, "Impossible Things"
...is 14 gripping tunes that range from breezy to super dark, with layers and layers of guitars, shimmering harmonies, and a pretty potent overall kick. You are absolutely going to like this album. Read the album of "Impossible Things" at maximumink.com. Listen to some "Impossible Things:"
Find You Out Mark gets spooky and slightly Latin. Honest Judge A bombastic tune from Nate. And don't forget our first CD: "The Easy Thing." With 13 songs of pure pop bombast, great liner art and other goodies. Read our profile/review in Madison's Isthmus. Here's a nice review of the album on Bill's Music Forum. Listen to tracks from "The Easy Thing"
Read lyrics for every song on The Easy Thing. Here's video, put together from several sources by Glenn Loos-Austin, from our 3/23/13 High Noon Saloon show. A little thing Mark slapped together in 12/08 using pictures graciously (and in most cases willingly) donated by his friends. More video, including live footage from a few other shows. The band was Matt Ackerman and Mark Lint (i.e. me), playing guitar and bass respectively and splitting the singing/songwriting duties. We got together in 2006; I'd been fronting bands since around 1992 but had gotten burned out after Madison Lint fell apart in 2004 and had basically retired from music. Though I started out on bass, I had played acoustic rhythm guitar in my last several line-ups, it being easier to arrange songs by just coming in with something ready to perform and having people play on top of me. My front man persona was (and is) theatrical: very caffeinated, more energetic than skilled. Matt was a few years younger. He'd played in several bands in the Madison area (and California before that) including Doll and the Sun Dogs (a cover band), mostly on bass. He had recently shifted from bass to lead guitar (but not singer) within Blamm-O, which was a band he was in for a few years before New People and which he was in concurrently throughout most of our lifespan. Though Matt had written songs, he'd never been a front man before. We had met in 2001 when we both worked at Epic Systems, and Matt jammed once as a possible third guitarist for Madison Lint, but there just wasn't room in the sound. I recall seeing him live as a bass player, and he was just a rock: this tall, solid presence that anchored the stage. We got back in touch when I saw he had posted an ad for a new bassist for Blamm-O. He knew that I wouldn't be happy in that setup, but said he was trying out a side project to play his original compositions, and invited me to play some of my songs in that too. For a few months, it was really just a matter of two friends hanging out and listening to songs, playing some. The whole format of our sound was built around Matt's guitar work and relatively straightforward rock approach: he had, for instance, written a song that was explicitly supposed to sound like Cold Play, and another like Nirvana. I picked among my back catalog of songs some tunes that would fit this format. I recall we recorded a drum-free demo, though I forget why at this point. We tried to get Johnny, Blamm-O's drummer, to play with us, but he couldn't handle two bands, and so in August, we hooked up with Julian Salgado Laredo, whose wife worked with Matt. Julian was a new immigrant from Mexico, didn't know a lot of people here, and didn't even have a place to play drums in his house. We practiced in Matt's basement, and he would let Julian leave his drums set up there and come over during the day when Matt was at work to practice. So we were all learning. Matt started taking voice lessons and was buying equipment and working on his songwriting. I was basically learning to play bass again and rejoicing in (for the first time since college) being in a band with a lead-quality singer to harmonize with instead of just getting instrumentalists to reluctantly chime in. Whereas in Madison Lint, it was my band, and other musicians drifted in and out without any ownership stake, it was a relief to have an equal partnership, and while we worked at a fairly slow pace, we got things done. We took what I call a "school play" approach to gigging, which is to play seldom, have a lot of material worked up pretty tightly for the show, and play largely at venues where we'd have control and could play on a good night as a headliner. We ended up in the basement of Glass Nickel Pizza on Atwood most frequently. This was a venue not known for music, so there'd be no walk-ins at all, but we could play a Saturday and pack the room with our own people, and run the sound ourselves, so it was generally a positive experience. I do recall some adjustment needed between our various stage styles, in that I'd tend to ham it up, while Matt would stand woodenly. As he got more confident and I toned things down, I think we reached some kind of equilibrium eventually. We had recorded a demo in late 2006 and at some point in 2007 got down to recording tracks for our first album. We recorded instruments live in Matt's basement, then would go back in and replace most of the guitars (or add the solos at least) and add in the vocals. Blamm-O had recorded before with Jake Johnson at Paradyme studios, and we decided to go in there to record two songs (my "Love Is the Problem" and a new recording of Matt's "The Last One") in maybe Summer 2008, and then also have Jake take the tracks from the other songs we'd recorded at home and mix them. We were pretty astounded at what he could do with digital tweaking to fix up our tracks, such that the home-recorded tracks (including "New People" from that original demo) when mixed for the album sounded just about as good as the in-studio tracks (and in fact, "The Last One" was a bit stiff and slow compared to our previous version; being able to record for as long as we wanted at home was actually better). Mixing took many sessions over the fall, and the album (The Easy Thing, which you can hear in full here) was released in early 2009. Despite my having recorded 10+ albums in the past, this was the first one where we had a really professional sounding (and looking) product, released through CD Baby to be on iTunes and all that, and I had a burst of energy when it came out taking it to local radio stations, sending it out to potential record companies, etc., not that anything much came of that. Even before the album's release, I created a quick video for "Love Is the Problem" and put a lot of work into promoting that. By the time the album came out, we already had just about all the material for album #2 in our performance set and were ready by the summer to get busy recording it. To Julian, this didn't make sense: we'd put this money into mixing and releasing the previous album, but hadn't used this to get ourselves a mess of shows, besides which, there had always been some stylistic tension between his playing style and the rock goals of the band, and frankly, a lot of Jake's digital fixing went into tightening up and often simplifying his drums (though our voices needed a lot of manual pitch correction too!). He complained about how, on a new song, he was playing a beat that he'd already played on a previous tune. Though we'd gotten very tight by the summery of 2009, he played his last show with us in August. This effectively delayed the recording of our second album for about a year. We auditioned several drummers and finally settled on Nate Pinney, recently also of Madison's Ghost Town Council. Nate aded some more ROCK energy to the band as well as a third vocal and songwriting chops. He was quite a bit younger than us, and had only switched to drums from guitar within the last few years, but he had great taste, and his musical creativity was very much in line with what we wanted to do. 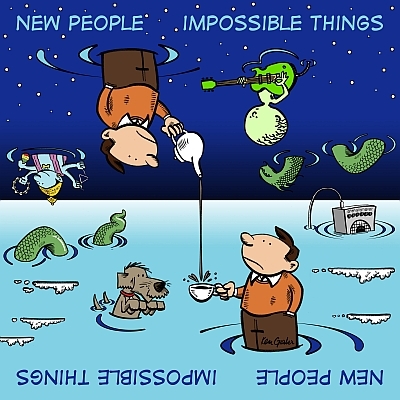 This new lineup recorded New People's second album Impossible Things (hear the whole thing here) from December 2009 through November 2010, with mixing and mastering running into early 2011. We continued our sporadic gigging, playing Brat Fest a couple of times, and making it onto the High Noon stage (the best gig in town for a minor group like us) a couple of times, but still sometimes returning to Glass Nickel. Nate added a new layer of sociability to the group, in that Matt and I had been around each other long enough that certain predictable minor clashes would occur (more ongoing irritations than actual events), and focusing on Nate pushed these things to the background. Matt also had some recurrent health issues related to music: both tendonitis and tenitis caused him to change his playing style, or not play for a while. Given the lack of reaction to our first album, I'll admit I put substantially less energy into promoting our second one. We started recording our third album, Might Get It Right, in late 2011, and from that point forward gigged out even less than previously. Matt had a second kid, Nate had gotten busy finishing his dissertation, and in fact left town through the whole summer of 2012, during which we did a few vocal sessions but little else. You'll notice that Nate brought two songs to our second album, but we could never get him to finish any for the third. Recordings for the album ran into late 2012, and three more songs were actually planned for it that didn't get finished; for at least one of these, a finished drum part got mysteriously erased. We declared the tracking done and went into Paradyme to mix in early 2013, but this time more often with just me there with Jake, or sometimes just Matt, and we'd let Jake finish 80% of the work before we'd show up to finalize decision-making. This was definitely not how we'd done things for the previous albums, when all of us were there most of the time during the mixing. By this time I was using as my sole outlet to promote our music my Partially Examined Life podcast, by putting one of my/our songs at the end of every episode, and I had the mixing on our first completed song for the album "Celebrity" rushed to be able to release it on an Oct. '12 episode featuring Lucy Lawless. To date this has still been my biggest brush with celebrity, but it meant that the other guys were not around for the mixing of it at all, and both thought it came out a bit too pretty. Just to repeat, the band was created to capitalize on Matt's sound and his tastes, but by this point, some of my more frenetic, humor-oriented tendencies were coming out as Matt's energy for controlling the band waned. Mastering on the album ran into 2013, and we had a great CD release party in May (which was nicely captured on video). Nate had known for many months that he'd be moving to Kentucky after this point, and Matt announced as we were finishing the album that he was burned out on this process. He later told me that he was considering and should have just broken up the band at this point. But I was still very much enchanted with the quality of our material. Matt had really blossommed as a songwriter since the first album. He had started with album #2 coming up with songs like "Lucky" that looked like a new kind of pop for him, and his material on our third album was really strong. And mine? Well, it's hard for me to judge; my album #1 songs were a collection of my best work from the previous five years, so #2 felt a bit poor by comparison, but by #3, I think I'd gotten some new creative momentum back, but it may or may not been in a direction that Matt especially enjoyed. You can listen to the entirety of Might Get It Right here. One experiment from the third album that I'm glad I pushed on as "Local." This was an instrumental from our first months in 2006, which we had just jammed on; the main riff was Matt's, but I'd written chords for the chorus, and we'd always planned to do something with it but never did. So I wrote some words and turned it into a usable song, and Matt ended up pushing back with me on several elements in the chord progression, so it turned out to be a real collaboration, though not using any recipe that promised easy creation of additional tunes along the same lines. Another leftover from our early days was "Stone," a dark song by Matt that I hadn't been that thrilled about originally, but it had been Julian's favorite song to play, and I warmed to it enough that I pushed to re-introduce it and finally record it for the third album. One of those left off the album was my "A Few Gone Down" (which I'd recorded with two previous bands), which Matt always thought didn't really fit with what we do. If we were going to keep going after Nate's departure, we were going to have to change up the formula, so even though I found a perfectly good replacement drummer within a month or two in Mike Laemmrich (a very tight, straight-ahead player, very cheery and prototypically Wisconsin), I also searched for a keyboardist. I'd been in touch with Eric Schumann since 2004, and he finally agreed to join us. Another keyboardist with a great voice, Chris Wellner, was diverted into becoming our acoutic rhythm guitarist. We'd been looking on and off for a second guitarist for years to take some of the burden off of Matt, and while this arrangement didn't allow him to solo less or otherwise relieve his wrist, it gave us a nice, full sound, with Chris's voice being especially strong, and Eric and Mike also harmonizing at some points for a really big sound. Chris was also an experienced songwriter; we played one of his songs and were planning to add more to the set. Two things came out of this new 5-piece lineup: We played a successful 11/23/13 show at High Noon that included some new material (like this song of mine that had not made it on to album # 3, and also this one, perhaps our first ballad, which I'd recorded previously as a remote collaboration with Eric and Lucy Lawless and other folks; Matt was too busy to contribute to that sudio version) and reworked songs from the previous album. Though the performance displays the roughness of a debut, the new arrangements seemed to really work (though we had at least one dissenting voice among the musicians in the audience that we were better as a 3-piece). Second, due again to a podcast deadline, I pushed us to finish a recording in September of a new song of mine "We Who Had Escaped," that we had only just started learning with the band. We recorded drums and bass at Eric's basement studio, then added the rest of my parts and Chris's guitar and voice at my house, so Matt only had to record his own parts at his house. The show energized me and the new members to do more recording and lots more live playing, but Matt was not interested. With him now being a dad of two, he said at this point he didn't want to be in two bands any more (the singer for Blamm-O had departed, but Matt and some of those guys were trying out a new project). He had felt in a rut with New People for a long time, and the last straw was having to record parts for my new song, which felt like a chore. Let's be clear: 75% of the work, time-wise, on the New People albums necessarily came from Matt. We would record the rhythm tracks together largely in the same way we'd rehearse, only with a bunch of extra mics and cords, and we'd have to adjust to listening to a click track and not having vocals going to queue us. In some cases, I'd fix or replace my bass parts later, and Matt and I would work together (often painstakingly) to get the vocal parts down (many of the harmonies were written during the recording process, and the harmonizing got richer as we went on and often included Nate too, when he was available), but particularly after album #1 (where we pared things down to keep it sounding relatively live), Matt would always put a heap of guitar parts on every song, and those are what set up the whole atmosphere of the song, provide a lot of the melodic content, and really make them great. So it was a let-down for him in recording on "Escaped" to find that even though we now had a 5-piece, the two new players weren't doing more than adding some color to the rhythm section and not filling in the space with riffs that would have allowed Matt to do less. Initially he sent me back just some distorted rhythm guitar tracks plus a solo, and I had to ask him to write some lead lines to flesh out the rest of the song. 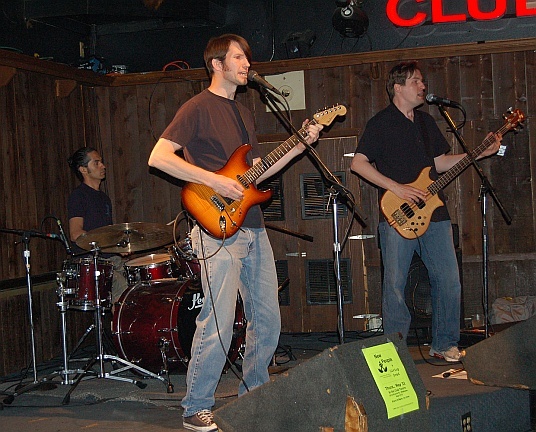 Matt felt that we were in a rut business-wise and had considered dissolving the band upon Nate's departure. I had tried doing more (I gathered the other musicians, I booked the show, I set the agenda) so that he wouldn't feel overwhelmed, but I had basically ignored his announcement after album #3 that he didn't want to record another album like that. I thought with the new people, the new direction, he'd get on board, but this really just served to marginalize him. So he quit, initially to be in a band where he wouldn't have to sing and could change up the style, but listeners to his new (very good!) band Blue Stone will find that it's quite similar: Matt's guitar writing over bass and drums (with Mike our final drummer joining him!) and pretty harmonies. So the issue was evidently one of not wanting to have to incorporate my agenda any more (i.e. my songs, my pushing to record), plus whatever personality conflicts may have gotten worse over the years. I'm still pretty unclear on this. I spent the spring of 2014 trying to get an acoustic line-up together. I gave up by the summer and recorded more with people over the Internet, releasing a solo CD at the end of 2015 (which includes New People's "Escaped" recording and most of my remaining material that would have appeared on New People #4). This released prompted me to start performing again, and I'm now back fronting on acoustic guitar with Mark Lint's Dry Folk. So both of these bands are alive and well (and Eric has put out more solo albums, and Chris and Nate are still doing various music things; I'm not sure if Julian ever found his dream jazz gig, but he's had kids and is doing well). Most likely you'll be seeing albums (well, at least some recordings posted online; does one need to record albums at this point?) from each of us exhibiting these new sounds before too long. So anyone who (like me) mourns the loss of a collaboration that was bigger than the sum of its parts can be consoled by potentially twice as much music being released by these people separately. Where did we play? 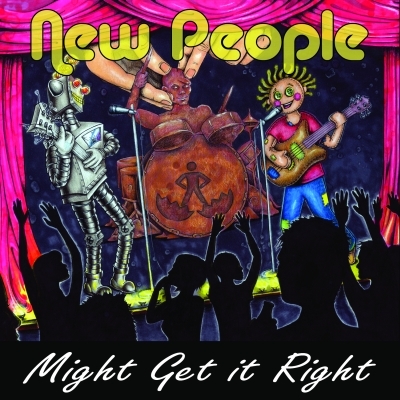 New People played shows in the Madison area since Spring, 2007, at Glass Nickel Pizza, the High Noon Saloon, Alchemy, the Frequency, Mother Fool's, and the Club Tavern in Middleton, as well as for two years at Brat Fest.. We've played shows with the Gomers, Centime, Anna Wang & the Oh Boys, A Minute Jack Forum, Two Bird Rock, Optometri, the Bar Code, Vanessa Tortolano, Paul Mitch, The Type, Tangy, Brian Daly from Sunshine for the Blind, and others. If you want to hear and read more about the ramp-up for this band back in 2006, check this archive page. For more songs and other things by Mark Lint, start here.